Plans for a £55m redevelopment of Alexandra Palace have been blocked because of a "fatal flaw" in the consultation process. Developers want to add a hotel and casino to the 130-year-old north London venue, the High Court heard. But Mr Justice Sullivan said lease details were not given in time for public consultation, so the whole consultation process must be reopened. 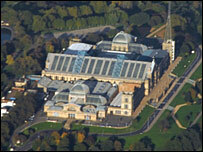 Save Ally Pally campaigners branded earlier public consultation "a joke". Alexandra Palace opened as a recreation centre known as "the people's palace" in 1873, but burned down 16 days later. It was rebuilt and the BBC made the first public television transmissions from its eastern building in 1936. Firoz Kassam, the former chairman of Oxford United Football Club, wants to refurbish the building's exhibition halls, add a 150-bedroom hotel, casino, bars and restaurants, and provide public leisure facilities on the site. But on Friday the judge quashed a Charity Commission order which permitted palace trustees to enter into a 125-year lease with Mr Kassam's development company, Firoka Group. After the ruling, Save Ally Pally campaign leader Jacob O'Callaghan said public consultation had just consisted of display boards about the development being placed in the palace's Palm Court. "Alexandra Palace is the birthplace of television, part of cultural history," Mr O'Callaghan said. "What does a display board mean to anyone outside the area, let alone someone living in America or Russia? "There is even a casino planned for it. This is a people's palace, not Caesar's Palace."